Look, even Homer nods. So yes, we missed A Quiet Place. Happily, a whole bunch of people found it without our help. Hooray for smart (by all accounts), small-budget horror! 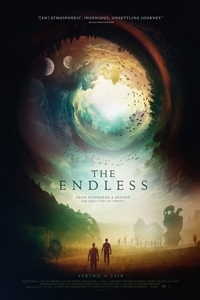 You know, like The Endless, the new film by San Diegan Justin Benson and (okay, Floridian) Aaron Moorhead. Reviews are overwhelmingly positive, including mine. But the sad fact is, it's playing at exactly one theater in San Diego this weekend. So maybe this one needs a little help. Which is what I'm trying to give it right here. I mean, you could see Lean on Pete if you're into the whole "good and sad" thing. Or Ismael's Ghosts, if you're into the whole "funky Frenchy film" thing. Or Final Portrait, if you're an Armie Hammer completist. Or Itzhak, which is really quite lovely, if a bit sedate. But The Endless has the distinct virtue of being truly local: made by San Diegans in San Diego's back country. Go team! Also opening, but unfortunately unreviewed: Outside In. April 21, 2018 @ 9:31 p.m.
April 22, 2018 @ 9:09 a.m.